← How Do You Like Your Eggs? October 2 saw the festive Autumn decor appearing all around the Blue hutch. 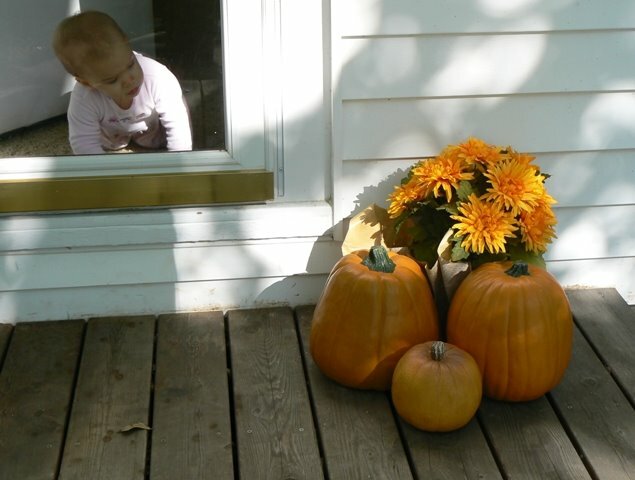 KB did NOT know what to think of the bright colored pretties that appeared on the porch during nap time. Bubba woke up and saw the scarecrow on the front porch bench and actually said, “We have a new baby doll.” Gettin‘ teary just remembering that. . .
And then there are gourds – which is hilarious to hear my children say . . . at EVERY meal. Little is SO literal that I have been telling her the decoration is to celebrate Autumn – not Fall. We do not celebrate falls and I am not sure she distinguishes the season, etc. 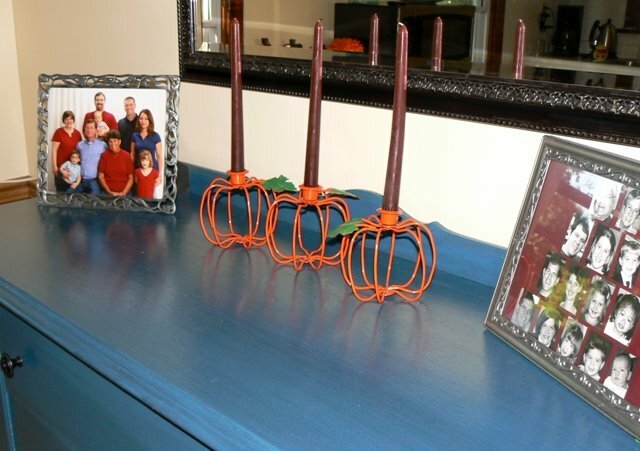 So, when I set these pumpkins out on the mysteriously and suddenly clean blue hutch, Little went into a verbal strand that was a bit like this, “And there are pumpkins on the blue hutch. And there are three. And there are candles to celebrate. Candles for Autumn on her birthday. Happy Birthday, Autumn.” To know her is to love her, folks. And, Debbie, no caramel apple candy corns this year. 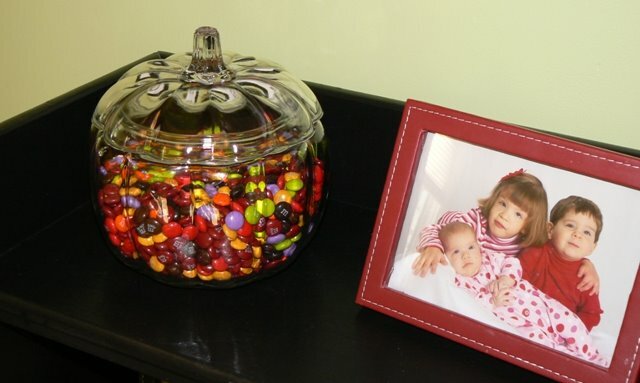 Instead we have Autumn colored M&Ms that are also acting as potty training prizes. Oh, and look at that adorable picture of those kids. . .
3 Responses to Happy Birthday, Autumn! I checked out the garlands–very clever! Let me see how yours turned out. That could be a fun project for us :). Mamogram…before you go… remember to take motrin/advil before your procedure AND if you are anywhere close to your monthly cycle… cancel the appointment…all I can tell you that I did none of the above and I was in tears the enter time! And they are cute kids. And there are three. And I will visit them soon. And I love them.